Fort Lauderdale  is a coastal city on the Atlantic Ocean in the US state of Florida. It is known as the "Venice of America" due to its expansive canal system. Situated in Broward County in South Florida, the city's population is over 170,000. 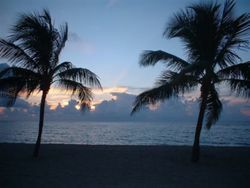 The city is most famous for its beaches and boats, and while the city of Fort Lauderdale is relatively small in area, the term 'Fort Lauderdale' is often used to refer to the larger metropolis that has grown up around it. It is the county seat for Broward county, and is part of the Miami-Fort Lauderdale-West Palm Beach metropolitan area, which has over 5.5 million people. The first inhabitants of the land were Seminole Indians who arrived in the 18th century. During the Second Seminole War, Major William Lauderdale led his Tennessee Volunteers into the area and raised New River Fort on the site of the modern city in 1838. In 1893, a young Ohioan named Frank Stranahan arrived and built a house that served as the first trading post, post office, bank and town hall of the area. The house was built near the site of the New River Fort and still stands today as a museum, Stranahan House. Fort Lauderdale was officially incorporated as a town in 1911, and became the seat of newly formed Broward County. It began as a predominantly agricultural community of dairy farms and citrus groves. More growth came with establishment of the Naval Air Station, which is now Fort Lauderdale/Hollywood International Airport. The city and its surrounding suburbs experienced tremendous growth following the end of World War II, and the arrival of home air-conditioning. In the 1960s, Fort Lauderdale became the center of Spring Break after the debut of the movie "Where the Boys Are." It is now an anchor of the Miami-Fort Lauderdale-West Palm Beach Metropolitan area, the nation's 6th largest metro area. Fort Lauderdale has a subtropical rainforest climate, which means all months of the year have a mean temperature of 18 C (65 F) or higher. As is typical in most tropical climates, there is a "wet/dry season". Much of the rainfall in Ft. Lauderdale falls in the hot and humid summer months from May though mid October. Daily thundershowers build up in the intense heat and quick, but intense, tropical downpours are common. Daytime temperatures are usually in the high 80sF or low 90sF with high humidity; nights are around 77F. The dry or low sun from November through April normally features sunny, dry, and warm weather with highs in the middle 70's and lows near 60 F. Some winters can be quite dry and brush fires and water restrictions in place. The warm tropical climate of Ft. Lauderdale gives the city a 12 month beach season. Fort Lauderdale/Hollywood International Airport (IATA: FLL) (ICAO: KFLL), located just two miles south of down town Fort Lauderdale . It is a major airport and popular low cost carrier destination. This is most convenient airport to Fort Lauderdale. Spirit Airlines maintains a hub here; JetBlue, Southwest Airlines, Delta Air Lines, and Virgin America all also have substantial operations here. FLL is the main domestic airport for the South Florida region. It is also an emerging hub for flights to and from the Latin America and the Caribbean. There are some limited charter flights to and from Europe. Many passengers are bound for or coming from cruises using Port Everglades, some two miles away. Many taxis, cruiseline buses, and hotel/motel shuttles make access to either easy. Several air charter companies, with piston aircraft, turbo props and jets are based here. Air Ambulance services are also available. You can take the Broward County Transit #1 bus along Federal Highway towards either Broward Central Terminal (Downtown Fort Lauderdale) or the Aventura Mall. Miami International Airport (IATA: MIA),  is located 25 miles south of Fort Lauderdale. It is the major international airport in South Florida, and known as 'The Gateway to the Americas'. Home of American Airlines Latin American hub with frequent flights to Latin America, the Caribbean, Europe, and US west coast. It is a 40 minute drive, south, from Fort Lauderdale using I-95, but can be much, much slower during rush hour. You can catch the Tri-Rail from Miami Airport to Fort Lauderdale station for about $4 a head. Then catch the linking bus, or get a cab from the station to the hotel. (More on Tri-Rail below). You can take one of the shuttle vans from Miami Airport to Fort Lauderdale, price varies by destination but will be around $50 to $70 per passenger. Palm Beach International Airport (IATA: PBI), 1000 Turnage Boulevard, West Palm Beach, Phone: (561) 471-7420, . This airport is another option. PBI, however, primarily serves the Palm Beach area and is the least convenient of the three airports for visiting Fort Lauderdale. Nevertheless, you can use Tri-Rail to get from Palm Beach Airport to Fort Lauderdale. Fort Lauderdale Executive Airport (IATA: FXE) (ICAO: KFXE), Located between Commercial Blvd and Cypress Creek Road just west of I-95 with entrances off West Commercial Boulevard at NW 12th Avenue, NW 15th Avenue and NW 21st Avenue and entrances off Cypress Creek Road at NW 10 Terrace and NW 24th Way and NW 28th Way. One of the ten largest general aviation airports in the country. Located in Fort Lauderdale, the airport is bounded by the cities of Tamarac to the West, Oakland Park to the South and Pompano to the North. Many privately owned aircraft are hangared or tied down here. Several air charter companies, with piston aircraft, turbo props and jets are based here. Air Ambulance services are also available. Pompano Beach Air Park (IATA: PMP) (ICAO: KPMP), Close to the beach in Pompano, between Atlantic Blvd and Copans Road just east of I-95 and east of Dixie Highway with two entrances off NE 10th Street. A mecca for flight training, this airport is home to single engine trainers, light twins and helicopters. Also home to Daher. Located in Pompano Beach.. Many privately owned aircraft are hangared here. Two air charter companies are based here; one Airplane Sightseeing Tour Company here, several helicopter operations. Tri-Rail, 1-800-TRI-RAIL, . Tri-Rail is a commuter rail line linking Miami Airport, Fort Lauderdale and West Palm Beach in Florida. It is run by the South Florida Regional Transportation Authority. The 72-mile system has 18 stations along the South Florida coast. The train connects to the Metrorail in Miami at the Tri-Rail/Metrorail Transfer Station. For more detailed information refer to the entry. From Miami International Airport you can catch the Tri-Rail to Fort Lauderdale, and then a bus connects you the last mile downtown. Tri-Rail runs less frequently on weekends, so check the schedule . Amtrak , 200 SW 21 Terrace, 1-800-872-7245. Provides service to cities up the Atlantic Coast of the United States. Amtrak has two stops in the Fort Lauderdale Area, one in Fort Lauderdale located on Broward Boulevard and I-95, and another one in the suburb of Hollywood on Hollywood Boulevard and I-95. The train goes south to Miami and north to Boca Raton. Interstate 95 (I-95) is the major North-South artery along the East side of the city. It connects Fort Lauderdale with the downtowns in Miami and West Palm Beach and goes north to Jacksonville and beyond. Florida's Turnpike runs North-South west of the city. To the south it connects to Homestead and the Florida Keys. To the North it connects to Orlando and North Florida. I-595/I-75 connects Fort Lauderdale to Florida's West Coast (including Naples, Fort Myers, Sarasota and the Tampa Bay area). Greyhound Bus Lines, 510 NE 3 Street downtown, telephone 1-800-229-9424, . Port Everglades, on the south side of the city center, is the most active container port and second most active cruise port in Florida. It supports a high number of cruise ships with about ten thousand passengers arriving and departing each week. Those able to drive here for a cruise may find Port Everglades somewhat more convenient and economical than Miami to park and stay overnight at local lodging, and then catch a shuttle to/from the ship's terminal. Numerous hotel/motel chains offer park/stay/cruise-shuttle packages. Most are also quite close to the airport. 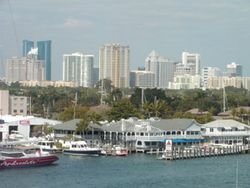 The east side of Fort Lauderdale, between down town and the beach, is criss crossed with canals. It doesn't matter if you are in a car, on bicycles, or on foot, you have to cross the canals where the bridges are. This is one town where a good map can save you a lot of backtracking. Surprisingly the best road map of the East side of town is the 'Dolphus Waterway Map". The US 1 does NOT intersect with Las Olas Boulevard. Your map is wrong if it says otherwise. The US 1 passes under the river in a tunnel and goes under Las Olas too, re-emerging only at Broward Blvd. to the north. This confuses many people who are trying to navigate around Fort Lauderdale. The easiest way to get around Fort Lauderdale and South Florida is by car. If you are renting—all the major national chains, and several local ones, can be found here—it is substantially less money to rent a car from a location outside of the airport. The city is set up on grid system and is fairly easy to navigate. Downtown is roughly two miles west of the beach. You need to consult a map when on the the East side of town because the canals divide up the city and you need to find the bridges. Broward County is served by three major Interstates (I-75, I-95, I-595) and some U.S. Highways including U.S. Highway 1, US 27 and US 441. It is also served by Florida's Turnpike and State Highway 869, also known as the Sawgrass Expressway. Taxis are generally expensive, but available at almost any time and place. Uber is becoming more and more popular no matter where you go in the United States. Fort Lauderdale is densely populated by cab companies and drivers, which creates a very hectic scene sometimes. Uber is available on your smart phone and can be requested whenever. it is good for late nights out and if you have an issue hailing a cab driver for whatever reason. The rates are about the same too, it is also popular amongst younger patrons who do not carry cash around them, the transaction is handled through your phone via debit card pre-sunk to the account. Fort Lauderdale is America's yachting capital, and as such has numerous boat charter and rental companies. There are many restaurants and bars along the intracoastal that cater to the passing yachtsmen and their guests. Water Bus  has 11 pick up/drop off locations in east Fort Lauderdale along the Intracoastal Waterway and New River. Float to and from the hotels, shopping, restaurants, beaches and nightlife. Slow and costly, but worth it for the view and romance. When you visit the beach you will see that many locals bike to the beach. Things in Fort Lauderdale are close, but often further apart than a quick walk. A bike makes everything much closer, and you don't have to find parking. By bike, it is only 10 minutes from the beach to downtown, the supermarkets, or the malls. A bike creates its own breeze so biking is not only quicker and less effort than walking, it's often cooler too. There are bike lanes on the road by the beach on A1A and on Las Olas Blvd. going between the beach and downtown and the Riverwalk. Ride in the same direction as the traffic. It is common to take to the sidewalks on the bridges or or on major roads when the bike lane disappears. Because most things are quite close and Florida is very flat, bicycles are a very green, very sane, and relatively quick way to get around. You also get to see more, hear more, and be able to stop easily along the way to take pictures, something that is difficult to do when in a taxi or a car. For a unique view of Fort Lauderdale, the Beach, The Everglades and surrounding cities take a scenic flight in an airplane and see it all. The most popular section of beach is where A1A runs along side the beach, between Las Olas Blvd north to Sunrise Blvd. The "Strip" also known as A1A is amongst the most popular locations, not just beaches, in Fort Lauderdale. There are a wide array of shops, restaurants, bars, and hotels amongst the strip creating a very unique experience right on the beach. The atmosphere careers towards the beach itself, which is that of being laid back, fun, and relaxing. The "Elbo Room" bar, located at Las Olas Blvd and A1A was featured in the 1960's film Where the Boys Are'. The movie led to the city's former reputation as a spring break mecca. The bar anchors the Southern end of the 'Strip', a strip of eating and drinking establishments that run along the land side of the beach road. Spring Break peaked in the mid 1980's and the city now attracts a more upscale crowd. Fort Lauderdale is in the midst of a luxury condo building boom, this is displacing the hotels that once lined the beach. The city is more cosmopolitan than most, having lots of Europeans and gay residents. The beach culture reflects the laid back nature of the community. You will find European food in the restaurants and bathers in thong swimsuits. Las Olas is probably the best place to get out of the house and take a stroll at, with lots of boutique shops. It is the newest part of Fort Lauderdale and is mostly new attractions. Over the past decade, Downtown/Las Olas Blvd has seen some substantial growth in population. What was once mainly shops, boutiques, and restaurants, has now turned into a place where developers and contractors are bringing in many high-rise buildings and condominiums. These new developments are expanding the very popular areas and bringing in a new wave residential market. The entertainment district runs east-west along Las Olas Boulevard. East Las Olas Blvd has a mile of upscale shops and restaurants. Across the railway lines, West Las Olas caters to a younger crowd. There are funky nightclubs and restaurants between the railway lines and the Broward Center for the Performing Arts. In between East and West, there is a new set of shops called Riverside that sits on the RiverWalk. The RiverWalk runs along the north side of the new river, from the shops at Las Olas to the performing arts complex. Wilton Manors is a city surrounded by Fort Lauderdale. It is a popular area for gays and lesbians. It has many guesthouses, restaurants, and bars/nightclubs catering to its gay clientèle. The busy center of the city is Wilton Drive near NE 26 Street. This is only two miles north of downtown Fort Lauderdale. Greater Broward County is home to 1.8 million people, and offers an wide array of activities. There are many things to do in Fort Lauderdale, but the beautiful beach is a prime attraction. There is parking just south of Las Olas Blvd or if that is full, there is plenty more under the Las Olas Blvd Bridge. The machines take cash or credit cards. There is more parking on A1A, North of Sunrise Blvd. You can rent a bicycle and explore along the beach, or head inland via Las Olas Blvd, to explore the upscale shops that line Las Olas towards the down town. From Las Olas the RiverWalk connects to the Arts and Entertainment district. Parking at some beach hotels is limited and with things quite close you will find bicycles are a good way to get around. You can go boating on the miles of waterways, take the water taxi, or take one of the river cruises like the Jungle Queen. There is also sport or deep sea fishing. If boating is not your thing, then you can just watch the boats go by from the many waterfront bars and restaurants. From Fort Lauderdale you can take a day trip to Miami's South Beach or downtown Miami, or closer to home, Hollywood Beach and Aventura. Popping down to visit the night clubs and restaurants along Hollywood Blvd near Young Circle is a close and interesting evening outing. On Friday and Saturday evenings the bars and clubs along SW 2nd Street come alive with young people. If you are under 35 this is the place to be on weekend nights. Known by locals as Cooley Hammock, this is the two blocks on SW 2nd St just West of the rail way tracks, near the Science Museum and Preforming Arts Center. You can take overnight excursions to the Florida Keys or the Bahamas, but both are just too far away to make good day trips. There are also organized coach trips to the theme parks in Orlando but again a bit too far for day trips. If you are only here for a week it may not make any sense to take several days out to bus hundreds of miles to a different city when there is so much to do here. The Florida Panthers of the National Hockey League play at BankAtlantic Center in suburban Sunrise, Florida. The Panthers organization resides in the BB&T Center in Hollywood, Florida. Inside the arena there are actually a number of bars and sport grills that make it one of the more unique experiences throughout the National Hockey League. There is a Duffy's restaurant which is well known in a few different locations in Fort Lauderdale, you can get seating that overlooks the ice so you can watch and dine. The tickets for the Panthers games also come cheap and they offer family packages if you're with your family on vacation. The Miami Dolphins play at Dolphins Stadium in Miami Gardens, Florida. The stadium is 17 miles South-West of Fort Lauderdale. The Miami Heat of the National Basketball Association play at AmericanAirlines Arena in downtown Miami, located 23 miles south of Fort Lauderdale. International Swimming Hall of Fame is located at Fort Lauderdale Beach. South Florida also hosts the college sports teams of Florida Atlantic University, Florida International University, Nova Southeastern University, and University of Miami. The Fort Lauderdale Strikers of the North American Soccer League play at Lockhart Stadium in North Fort Lauderdale only 12 miles from the downtown area. There are sports and events held year round; although less frequent in the summer due to the intense heat. There are so many local running races during the cooler months that they may be held just several weeks apart. Greater Fort Lauderdale Road Runners  keeps a central listing of running races on their web site. Located a couple of streets over from A1A beach is the iconic International Swimming Hall of Fame facility. Not only is this a location where some of the most renown olympians in the world compete, but it also has public hours where anyone can go and partake in open swim while doing their own laps and maintaining a good workout routine. There is a small gift shop inside the complex as well where tourists like to go and get souvenirs/clothing with the "ISHOF" branding on it. There are a good number of local Triathlons, mostly the shorter sprint distances. Jungle Queen. Dinner cruise featuring sites along the New River in and around downtown. Pier Fishing at Commercial Blvd, Atlantic Blvd, Hillsboro Blvd and Dania Beach. Each area has long piers into ocean, and fishing available. Bahia Mar Marina. Just across from the beach. You can walk around the marina and look at luxury boats and yachts owned by the well-heeled. On one jetty there is a monument and plaque announcing slip F-18 as an American Literary Landmark - this is where author John D MacDonald's fictional hero, Travis McGee , moored his 52-foot houseboat The Busted Flush (21 Travis McGee novels were published). Shops on Las Olas Blvd,Little specialty shops and upscale restaurants line Las Olas Blvd, starting down town and running East on Las Olas Blvd for a mile, to SE 15th Avenue. Most shops and restaurants are open late in the evenings. Galleria Mall, Sunrise Blvd and Bayview Dr. Fort Lauderdale's regional mall. Has over 200 stores including: Neiman Marcus, Apple, Macy's, Dillard's, and Saks Fifth Avenue. This is only 1/4 of a mile, about ten minutes walk from the beach. Broward Mall, located in Plantation at Broward Blvd, and University Drive. Coral Square Mall, located in Coral Springs at Atlantic Blvd. and University Dr.
Festival Flea Market, located in Pompano Beach on Sample Rd, just east of Florida's Turnpike. Large indoor flea market. Pembroke Lakes Mall, located in Pembroke Pines at Pines Blvd. and Flamingo Rd. Pompano Square, located in Pompano Beach at US1 (Federal Hwy) and Copans Rd. Aventura Mall, large, upscale regional mall located in Aventura. Boca Town Center, large, upscale regional mall located in Boca Raton. Swap Shop. 1+954-583-2221. The Swap Shop is an older flea market located west on Sunrise Blvd. at a drive-in movie. Along with getting your hair braided you can shop for fruits, vegetables, clothes, nick knacks, and practically any other things other locations would not have. Clothes Encounters, 1952 E Sunrise Blvd, Fort Lauderdale, Phone: +1 954-522-2228. Huge selection of funny t-shirts along with basic swimwear and gifts. Flagler Antiques, 720 Flagler Drive, Fort Lauderdale. 10,000 Square Feet of antiques. Shop at Swap Shop. Get your hair braided there Phone: +1 954-583-2221. The Swap Shop is an older flee market located east on Sunrise Blvd. Along with getting your hair braided you can shop for fruits, vegetables, clothes, nick knacks, and you can practically find other things that other locations would not have. Zoo 14, 1208 NE 4th Avenue, Fort Lauderdale, Phone: +1 954-763-9666. Men's designer clothing and club wear. Lilac And Lilies Boutique, 2541 E. Sunrise Blvd., Fort Lauderdale, Phone: +1 954-530-3109. Women's designer clothing and accessories. Once heavily reliant on tourism and the very large marine industry, Fort Lauderdale's economy is now diverse and based on many small and medium business. Several large companies are based in the Fort Lauderdale area including: AutoNation USA, Citrix Systems, DHL Express, Spirit Airlines, Merchant Financing Leads and National Beverage Corp. Due to its proximity to Miami, Fort Lauderdale is emerging as a location for Latin American headquarters for companies such as Microsoft. Fort Lauderdale is a major manufacturing and maintenance center for large and expensive private yachts. The boating industry is responsible for over 100,000 jobs in the area. With its many canals, and proximity to the Bahamas and Caribbean, it is also a popular place to keep a yacht, and a major stop for nautical staging and refitting. Unfortunately the boating industry is being squeezed out because waterfront property continues to increase in value and this is forcing some marinas and shipyards to sell out or relocate out of the area. The total number of available boat slips is also declining as marinas are more actively seeking a few large mega-yachts instead of several smaller boats. Even so, the marine industry continues to grow, catering more and more to the mega yachts. There is now a section of the old State Road 84 that has been renamed Marina Mile where the mega yacht industry is booming. During the 1970s, the city's tourism was largely driven by younger people, because Fort Lauderdale was infamous for being THE spring break destination for college students. This changed in the late 1980's when there was a crack down on underage drinking. Fort Lauderdale is now less of a college spring break destination and does more year round business with European families and upscale US tourists. The city also has a booming cruise ships industry: every day there are shiploads of tourists leaving and arriving at the sea port. Fort Lauderdale is filled with not only beaches and hotels, but various restaurants that suit a wide variety of people, food types, and budgets. Ranging from Las Olas and Downtown which contain a more upscale dining experience, to beach side restaurants by "The Strip" which are fun for family and friends on vacations. Cafe Europa, 910 E Las Olas Blvd, Fort Lauderdale, FL 33301. 954-763-6600. Located on Las Olas Boulevard, Cafe Europa is a classic Italian restaurant. It is a very ambient setting that makes for a nice night out with friends and family. They specialize in authentic brick oven style pizzas made from scratch. Quarter Deck, 2933 E Las Olas Blvd Fort Lauderdale, FL 33316. 954-525-2010. Quarterdeck is located right on Las Olas Boulevard, the side that is closest to the beach, it is in walking distance from Beach Place and “The Strip”. It is similar to Applebee’s but offers a more southern style comfort food to its menu. Wide variety of seafood and meats, buffalo wings, and of course a souther staple of tater tots as a side. Quarterdeck provides a quality meal and is better suited for a quick bite or family meal from vacationers and beach goers. Primanthi Brothers, 901 N Fort Lauderdale Beach Blvd, Fort Lauderdale, FL 33304 954-565-0605. Also located right by the beach, Primanthi Brothers is a sandwich and grinder shop that has been featured on various Food Network television shows (in part due to the fact they load up most sandwiches with french fries as a topping) such as “Diners, Drive-ins, and Dives”. Their menu features countless sandwich creations that will be able to satisfy the hungriest of customers. In the event that there is not a pre determined menu item that catches your eye, you have to ability to have them make whatever sandwich you'd like. Good for a quick lunch or dinner before, during, or after the beach seeing as how it is in walking distance. Hooters, 17 S Atlantic Blvd #304, Fort Lauderdale, FL 33316. 954-767-0014. Located inside Beach Place, the outdoor shopping and dining plaza on the beach; Hooters is a typical sports/wing bar chain. It is not exactly a family environment, but it serves a purpose of having cheap wings and drinks with a plethora of TV’s to watch a game on. Mai-Kai, 3599 N. Federal Highway. Phone: 954-563-3272. Tiki-themed restaurant featuring Polynesian food and live shows. Rosie's, Wilton Drive. Great hamburgers and lite fare, with large outdoor seating area. Fun gay-themed restaurant, with live music on weekends. Red Cow, 1025 N Federal Hwy, Fort Lauderdale, FL 33304 (954) 652-1524. Excellent BBQ with a relaxed vibe. Georgies Alibi, 2266 Wilton Dr, Wilton Manors, Phone: 954-565-2526. Gay bar & casual restaurant (hamburgers & sandwiches). Friendly, diverse "straight-friendly" crowd; lunch & dinner served both indoors & outside under covered patio area. Very reasonably priced. Pomperdale' 3055 East Commercial Boulevard (954) 771-9830 An excellent New York Jewish style deli. The Village Grille 4404 El Mar Drive Lauderdale-By-The-Sea (954) 776-5092.  . Great place for breakfast, lunch and dinner or just drinks. Next to the beach. $8-$12. Try the banana nut pancakes, they are to die for. Laspada's Original Hoagies' 4346 Sea Grape Dr Lauderdale-by-the-Sea (954) 776-7893  . Hole-in-the-wall serving mouth-watering hoagies. Five minute walk to the beach. During the early 1980's, Fort Lauderdale became the hotspot for young college students on spring break, where the strip and beaches were littered with people all week. While Fort Lauderdale has grown away from just a party destination, it still remains a great spot to go out to town with friends for drinks. There are various sections and parts of town that career to different crowds. Las Olas is more of a refined bar and lounge scene, whereas "The Strip" still careers to party goers and a younger crowd who are looking for the bars that stay open a little bit later. Most bars are restaurants during the day and turn into a 21+ environment later on in the evening, respectfully. Below theres a list of the various spots and what their environments are like. Tarpon Bend, 200 SW 2 Street (Old Town). Great beer specials and popular on weekends. YOLO, 333 E Las Olas Blvd, Fort Lauderdale, FL 33301. 954-523-1000. Upscale restaurant that turns into a hot spot for high rollers later on in the night. Buzzing atmosphere. Vibe, 301 E Las Olas Blvd, Fort Lauderdale, FL 33301. 954-713-7313. Club located on the corner next to YOLO. Electric atmosphere which has live music via DJ's. There is a cover depending on the night and usually a line. Vibe is the place to go to if you're looking for a wild night out. America's Backyard, 100 SW 3rd Ave, Fort Lauderdale, FL 33312. 954-449-1025. Typical bar that has cheap drinks and great specials. Mostly dominated by a younger, college crowd of people and locals. Rock Bar, 219 S. Ft. Lauderdale Beach Boulevard. Fort Lauderdale, FL 33316. 954-533-1568. Located right on "The Strip" Rock Bar is a restaurant and lounge that turns into a bar at night with a DJ on the busy nights inside. It has big lounge chairs and couches outside right on the beach that make for a good atmosphere to hangout with friends. They also offers hookahs and good drink specials. Da big Kahuna, 17 S Fort Lauderdale Beach Blvd, Fort Lauderdale, FL 33316. 954-530-4867. Also located inside Beach Place on "The Strip" Da Big Kahuna is a restaurant during the day with an island theme that carries over into a 21+ bar at night. They usually hand out drink coupons and tickets for happy hour and buy-one-get-one free drinks outside during the day. There is usually live music of some sorts or karaoke throughout the night. Da big Kahuna is great for a night out and is fine for anyone between the age of 21-40. Cheap drinks, good entertainment. Fat Tuesday's, 17 S Fort Lauderdale Beach Blvd, Fort Lauderdale, FL 33316. 954-525-6090. Located across from Da Big Kahuna on the same floor in the complex Fat Tuesday's is a beach-bar chain that is located in frequent tourist destinations. They include good drink deals and specials. They specialize in foam covered cups that have a mixed, frozen-alcohol beverage in them that can be carried to the beach across the street. Not very expensive, a place that is frequented by college kids and younger adults, especially during the months of March and April with all the breaks from school. 'Sopranos Dueling Piano Bar, 17 S Fort Lauderdale Beach Blvd, Fort Lauderdale, FL 33316. 954-533-7973. Connected to Da Big Kahuna via a velvet curtain, Sopranos offers an experience that is extremely unique to the area. While most bars on "The Strip" are catered towards younger crowds, Sopranos as an upscale location with two pianos that are pitched against each other. Two pianists duel against each other while taking requests from the patrons of the bar. This careers to an older crowd of people in their 30's to 40's for the most part, but still a good place to go and relax but still have fun. Blondies Sports Bar 229 S. Fort Lauderdale Beach Blvd. Fort Lauderdale, FL 33316. 954-728-9801. Blondies is located almost right on the beach, it is a classic dive bar with a local road inside. Cheap drinks, its good to go and just grab a quick drink with friends or family when you're in the area and not looking for anything overwhelming or crazy. LuLu's Bait Shack 17 S Atlantic Blvd #212, Fort Lauderdale, FL 33316. 954-463-7425. LuLu's is yet another restaurant turned into bar at night. They are well known for good seafood during the day, and fun atmosphere at night. They are all known for their "fishbowls" which is an actual goldfish bowl filled up with various different juices and alcohols to be share with a table of friends. Grady's Bar at 905 S. Andrews Avenue is a hangout for locals, open since 1940. Cheap drinks and food, cash only. Flossie's Bar and Grill 3985 Angler's Avenue on the opposite side of I-95 from the airport. Outdoor tiki bar with live music some nights. Popular biker hangout. Georgie's Alibi,  at the Shoppes of Wilton Manors. Wilton Dr. and NE 6 Ave.
Hunter's Fort Lauderdale, a nightclub at Shoppes of Wilton Manors. Wilton Dr and NE 6 Ave.
Roxanne's on Main,  on the corner of Dixie Highway and Oakland Park. Music, drinks and food. Funky Buddha,  Dixie Highway and NE 38th St. Popular local microbrewery with a large taproom and outdoor seating. Lago Mar Resort, 1700 S Ocean Ln, Fort Lauderdale, FL 33316. 954-678-3915. Lago Mar is a tropical themed resort and private members club located right on its very own section of the beach. It is a "4 Star" hotel that has multiple amenities that career to almost any guest. It holds two pools on the resort, a tennis court, playground, and two small beach front restaurants that are available for the guests to grab a quick bite to eat throughout the day. Great family environment if you plan on staying for a week or two so you can fully take advantage of all the amenities that it has to offer. Sheraton Yankee Clipper Hotel, 1140 Seabreeze Blvd., Ft. Lauderdale, FL 33316. One of the more iconic hotels located close to Fort Lauderdale Beach. The hotel is shaped and design to look like a passenger ship and is an extension of the Sheraton hotel on the other side of the street, they connect via sky bridge. The Yankee Clipper provides a basic, but clean environment with many rooms that face the ocean and beach, popular amongst tourists and traveling businessmen and women who attend the various trade shows in town throughout the year such as the International Boating Show. The Bonaventure Resort & Spa Fort Lauderdale Hotel, 250 Racquet Club Rd, +1 954-389-3300, . Full-service spa, two 18-hole PGA championship courses and five inviting pools. El Palacio Ft. Lauderdale Resort, 4900 Powerline Road , +1 954.776.4880, . Days Inn Ft Lauderdale/Oakland Park, 1595 West Oakland Park Blvd., +1 954-484-9290, . Elysium Resort, 552 N Birch Road, Phone: +1 954-564-9601, . Large resort catering to gay men. Jacuzzi and two pools. Embassy Suites, 1100 SE 17th St., Phone: +1 954-527-2700, . An all-suite hotel situated in the heart of Fort Lauderdale. FTL Vacation Rentals, offering 1, 2 and 3 bedroom vacation homes. NE 17th Ave @ NE 12th St, Phone: +1 800-954-5309, . Fort Lauderdale Marriott Harbor Beach Resort & Spa, 3030 Holiday Drive  features a private beach, full service spa, and 100,000 Sq Ft for indoor and outdoor events. Hawthorn Suites,2201 N. Commerce Pkwy., +1 (954) 659-1555, Fax: +1 (954) 659-1191, . Liberty Apartment & Garden Suites, 1500 S.W. Second Avenue, (Dania Beach), +1 954-927-0090, . Greater Fort Lauderdale's first and only exclusive extended stay resort hotel welcoming the gay and lesbian community and their pets. Marys Resort, 1115 Tequesta Street, Phone: +1 954-523-3500 or 1-866-805-6570, . Pet friendly, 4 cottages, heated swimming pool and Jacuzzi. Most have kitchenettes or full kitchens. Location is near the cultural area of Downtown, but close to beaches. The Royal Palms, 2901 Terramar Street , Phone: +1 954-564-6444 or +1 800-237-7256, . The Royal Palms is rated the # 1 gay resort in North America by Planet Out, the gay travel experts. The decor is delicious, the service exceptional and amenities without parallel in the gay guesthouse world. A gem in the heart of gay Ft. Lauderdale. Sheraton Suites - Cypress Creek, 555 NW 62nd St., Phone: +1 954-772-5400, . In the middle of the north business district. TownePlace Suites Fort Lauderdale West, 3100 Prospect Road, Phone: +1 954-484-2214, Fax: +1 954-484-4533, . Worthington Guest House, 543 N.Birch Road, 1-800-445-7036, . The Worthington Guest House is a gay men's resort in "The Island" area of Ft Lauderdale. They boast 12 man jacuzzi and a large pool, both of which are open 24 hours a day. The Worthington is convenient to the town's gay nightlife, dining and shopping and only a 5-minute walk to the popular Sebastion Street Beach. Windamar Beach Resort, 543 Breakers Avenue, +1 954-561-0039, . Fort Lauderdale's friendliest gay guesthouse. Clothing optional throughout. Large heated 24 hour pool and a brand new hot tub. Lush landscape, newly renovated fully air conditioned rooms. Video lounge / dark room complex. Day passes available. Free BBQ & refreshments on weekends. Great place to meet locals. A few steps away from the gay beach, at Sebastian. Pet friendly. Wyndham - Airport, 1870 Griffin Road, Phone: +1 954-920-3300, . Adjacent to the FLL Airport and features 388 sound-proof rooms. In order to make local phone calls, all ten digits of the phone number are required. As such, you'll notice that all local phone numbers include an area code. Currently the local area codes are (954) and (754), both local so you don't dial a 1 first but do dial the area code. Area codes for Miami are (305) or (786) and for Boca Raton and Palm Beach it is (561). Fort Lauderdale is served by two English-language newspapers, the Sun-Sentinel|South Florida-Sun Sentinel and The Miami Herald, as well as two Spanish language|Spanish-language newspapers El Sentinel del Sur de la Florida|El Sentinel and El Nuevo Herald. Fort Lauderdale is considered to be part of the Miami media market, which is the 12th largest radio market and the 17th largest television market in the United States. Television stations serving the Miami area include WAMI (Telefutura), WBFS (UPN), WBZL (WB Television Network|The WB), WFOR (CBS), WHFT (TBN), WLTV (Univision), WPLG (American Broadcasting Company|ABC), WPXM (i television network|i), WSCV (Telemundo), WSVN (Fox Broadcasting Company|FOX), WTVJ (NBC), WPBT (PB), and WLRN (also PBS). Fort Lauderdale can be very safe, but like all major cities, there are some parts of town you should probably avoid if you are on foot at night. The areas frequented by tourists, such as along the beach, shopping along Las Olas and downtown are generally more than safe. However, you may want to use more caution if in the west, northwest or southwest areas of the city, especially at night. If in doubt, it's always good idea to ask for advice on which areas are safe and which should be avoided. Rental cars stand out as obvious targets for thieves, so never leave valuables in a visible place (put any purchases or valuables in the trunk) and always lock your car doors. Tourists may find South Florida drivers get impatient with the heavy traffic during high season. Try to plan your route before setting off and remember that US1 tunnels under Las Olas Blvd and the river. It may look like the two intersect on a map but they don't. South Florida has quite a few senior citizens on the road so be alert. Emergency telephone number for fire, police and rescue emergencies is 911. When driving, realize traffic is heavy, and there are people from all over the world with completely different driving habits. This feeds South Florida's reputation for having rude drivers. The problem lies in different people with different driving habits and that their ages run from 16 to over 100. Drive carefully and defensively. Port Everglades is the nation's second busiest port for cruise ships, after Port of Miami. There are many cruises of varying lengths (1 day to several weeks) available to choose from. The airport offers a free shuttle bus to the port for car renters. Many off-airport rental car locations also offer port shuttles. South Florida (Miami-Fort Lauderdale-West Palm Beach) is home to over 5.5 million people, and is the 6th largest metropolitan area in the United States. As such, the areas surrounding Fort Lauderdale have plenty to offer, particularly Miami. This page was last edited on 7 January 2019, at 04:50.